To meet all the requirements from embedded applications, Advantech devotes regionally-based customer oriented services to each project. Advantech DTOS team is dedicated to offering specific regionally focused Design To Order Services to enable our customers to reach their customers more quickly. Advantech supports local order processing and provides comprehensive global support. 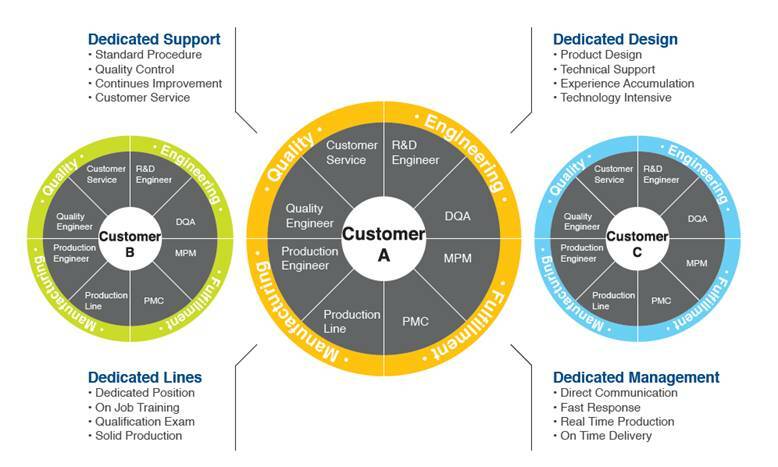 With our dedicated regional Design To Order Services team, located in four Regional Service Centers across the world, we deliver a faster time-to-market,design, manufacturing and service centers and efficient local support in Americas, Europe, Asia Pacific, and China. DTOS projects are produced in dedicated manufacturing sites at Kunshan, China and Taipei, Taiwan. Our advanced DTOS facilities allow us to produce all board and system level products. The facilities are designed to service ODM oriented customers, so allow us to customize production to meet your demands for any product in any vertical market. Our task oriented manufacturing project team called Customer Focus Team (CFT), is composed of engineering, fulfillment, quality, and manufacturing experts to deliver successful projects to our customers for even faster time-to-market. Advantech DTOS team is a team of embedded experts offering dedicated project design, dedicated project management, dedicated manufacturing service and dedicated project support service. From our well-structured design process management, our project managers and design specialists work closely with customers to help them save development time without worrying about compatibility issues, just contact your dedicated service team. Advantech provides a wide range of embedded system boards for CPU, I/O, communication and video solutions. We are able to design for all kinds of applications from high-performance to low-power embedded computing boards. High availability across all form factors ensures our board-level solutions meet specific application needs and processor speed, memory configuration, I/O expandability and demanding environmental requirements. Providing flexibility and rock-solid reliability, our system-level solutions are perfect for any computing environment. Advantech's vertically-integrated solutions, as well as their hardware and software interfaces, are all based on open standards. This provides our system-level solutions architectural-level longevity across different applications - from applied panel computing to Medical, from Industrial Computing to Network Appliances and from CompactPCI to Human Machine Interface (HMI).